The microrobot backbone was built with a biocompatible and elastic material—polydimethylsiloxane (PDMS)—by using a specially designed 3D molding aligner, and consisted of three strips of PDMS legs connected across a body. Cardiomyocytes were then plated on the grooved top surface of the backbone, resulting in a high concentration of pulsating cells. These key techniques enabled the microrobot to walk continuously for over ten days. The performance of our crab-like microrobot was measured at an average velocity of 100 µm s–1, and the estimated total distance it travelled was 50 m over a one-week period. Thus, we have demonstrated for the first time a walking robot that exhibited reliable and long-term actuation performances. 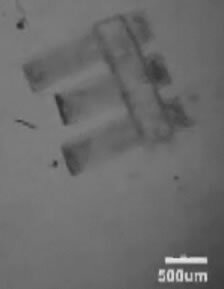 When the neonatal rat heart tissue contracted, the robot’s six horizontally aligned legs (see image below) pulled together. When the tissue relaxed, the legs drew apart. The pulses propelled the robot forward. 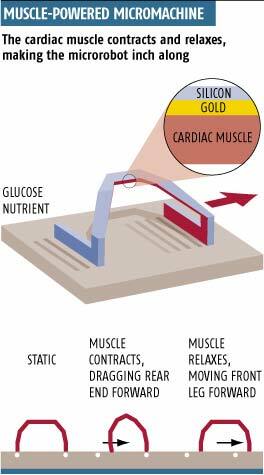 No speed demon, the rat heart muscle robot streaked through a solution at 100 micrometers per second (about 0.0002 mile per hour). This is by no means the first muscle-powered robot. Take a look at the micromachine shown below. SF fans will enjoy comparing this tiniest of robots with the muscle-powered power wagons from Jack Vance's phenomenal 1967 novel The Last Castle. Power-wagons, like the Meks, originally swamp-creatures from Etamin 9, were great rectangular slabs of muscle, slung into a rectangular frame and protected from sunlight, insects and rodents by a synthetic pelt. Via Tiny Robot Walks Using Rat Heart Muscle.